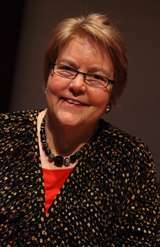 Bunch participated in or facilitated numerous international workshops and conferences, and from 1979 to 1980 she was a consultant to the secretariat for the World Conference for the United Nations Decade on Women. At its 20th Anniversary Symposium on March 6, 2010, following panel discussions on body, economy, and movement, CWGL organized a tribute to its founder, Charlotte Bunch, who transitioned on September 1, 2009 from her role as executive director to working with CWGL in her new capacity as founding director and senior scholar. Attendees watched a short preview of the then-upcoming documentary film Passionate Politics: The Life & Work of Charlotte Bunch (2011), directed by Tami Gold, which chronicles Bunch’s lifelong personal and political commitment to women’s human rights. She has served on the boards of numerous organizations and is currently a member of the Advisory Committee for the Human Rights Watch Women's Rights Division, and on the boards of the Global Fund for Women and the International Council on Human Rights Policy. She has been a consultant to many United Nations bodies and recently served on the Advisory Committee for the Secretary General's 2006 Report to the General Assembly on Violence against Women. Lesbianism and the Women's Movement. Baltimore, Md. : Diana Press. 1975. ISBN 0-884-47006-7. OCLC 1365238. Building Feminist Theory: Essays from QUEST, a Feminist Quarterly. New York, N.Y.: Longman. 1981. ISBN 0-582-28210-1. OCLC 256686819. Passionate Politics: Essays, 1968–1986: Feminist Theory in Action. New York: St. Martin's Press. 1987. ISBN 0-312-00667-5. OCLC 15196697. Transforming the Faiths of our Fathers: Women who Changed American Religion. New York: Palgrave Macmillan. 2004. ISBN 1403964602. ↑ "Legendary Women of Causes, Charlotte Bunch Profile". Causes.goldenmoon.org. October 13, 1944. Retrieved July 18, 2010. ↑ Gross, Jane (May 31, 2000). "Charlotte Bunch, NYTimes Profile". Nytimes.com. Retrieved July 18, 2010. ↑ "Charlotte Bunch Staff Profile, Center for Women's Global Leadership". Cwgl.rutgers.edu. Retrieved July 18, 2010. ↑ "Center for Women's Global Leadership". ↑ "Films for the Feminist Classroom". ↑ "Entry on Bunch in the Encyclopedia of Gay, Lesbian, Bisexual, Transgender, and Queer Culture". Glbtq.com. October 13, 1944. Retrieved July 18, 2010. ↑ "Introductory Letter from Radhika Balakrishnan, New CWGL Executive Director" (PDF). Retrieved July 18, 2010. ↑ "Bunch's June 14, 2010 statements at the UN on behalf of the GEAR Campaign" (PDF). Retrieved July 18, 2010. ↑ "Reflections on the 54th CSW and GEAR". Global Fund for Women. Archived from the original on June 11, 2010. Retrieved July 18, 2010. ↑ MacFarquhar, Neil (July 2, 2010). "A U.N. Agency for Women? Yes! But Those Names...". The New York Times. Retrieved June 11, 2012. ↑ "Program Highlights, Including a short description of the Symposium and Bunch Tribute". Cwgl.rutgers.edu. Retrieved July 18, 2010. ↑ "See Page 74 of this 148-page CSW 54 Handbook put out by the NGO Committee to the CSW for a one-page flyer for the CWGL Symposium Beijing +15 Parallel Event" (PDF). Retrieved July 18, 2010. ↑ "NCRW Hosts Article from SAGE Magazine | May 2010 about Charlotte Bunch, including a mention of the March Tribute". Ncrw.org. Retrieved July 18, 2010. ↑ "Podcast of the tribute to Charlotte Bunch at the 20th Anniversary Symposium" (MP3). Rutgers.edu. Retrieved June 11, 2012. ↑ "Passionate Politics: The Life & Work of Charlotte Bunch". Retrieved October 7, 2012. ↑ "Charlotte Bunch Women's Human Rights Strategic Opportunities Fund Launched" (PDF). Retrieved July 18, 2010. ↑ "ICHRP Homepage". Ichrp.org. Retrieved July 18, 2010. 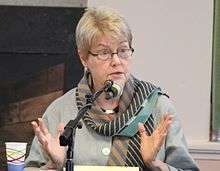 ↑ "Former Council and Board Members ICHRP List, Including Charlotte Bunch". Ichrp.org. Retrieved July 18, 2010. ↑ Danne Polk. "Charlotte Bunch biography on QueerTheory.com's A Legacy of Names". Queertheory.com. Retrieved July 18, 2010. ↑ "National Women's Hall of Fame, Charlotte Bunch Profile". Greatwomen.org. Retrieved July 18, 2010. ↑ "Charlotte Bunch Awards List". Cwgl.rutgers.edu. Retrieved July 18, 2010. ↑ "Rutgers University Department of Women's and Gender Studies". ↑ "Charlotte Bunch's Papers, 1967–1985". Oasis.harvard.edu:10080. October 13, 1944. Retrieved July 18, 2010. ↑ "Charlotte Bunch's Papers, 1950–1988". Oasis.harvard.edu:10080. Retrieved July 18, 2010. Hartmann, Heidi I. (interviewer) (Summer 1996). Ellen Bravo, Charlotte Bunch, Nancy Hartsock, Roberta Spalter-Roth, Linda Williams and Maria Blanco. "Bringing together feminist theory and practice: a collective interview". Signs, special issue: Feminist Theory and Practice. Chicago Journals. 21 (4): 917–951. doi:10.1086/495126. JSTOR 3175029.